Dewey's 24-Hour Readathon is finally upon us! This will be my second time participating, and this is how I feel about it. Had I not participated, I also would never have met some of the loveliest people the internet has to offer, nor would I know that there's a bi-annual holiday that's all about reading. My life would definitely be a lot emptier. Know that you don't have to prep at all! Got a book you've been meaning to finish? Read that! Got a packed Saturday schedule and only a few minutes here or there to open a book? Do that! Ultimately, the Readathon is meant to connect you with other book lovers and provide a great excuse to dive into some tasty, tasty reading. Here are two posts by Maree and Ellie that perfectly sum up the point that the Readathon is all about having a good time. 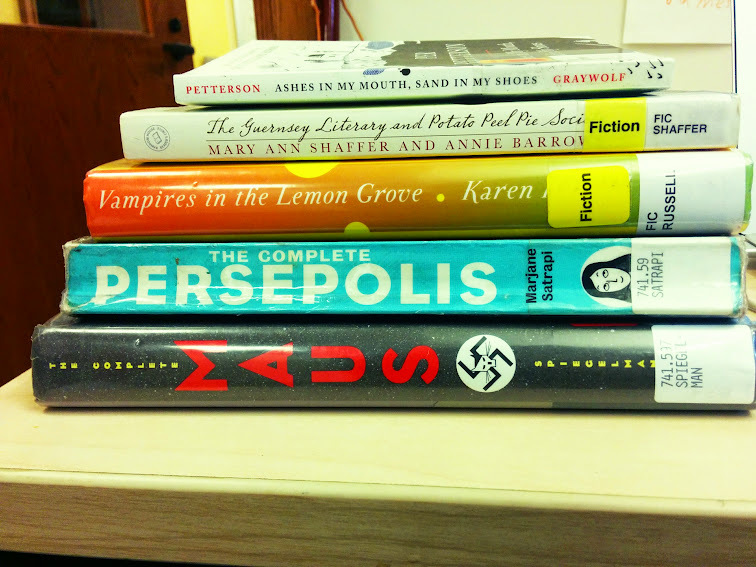 Readathon is the very best excuse for checking out far too many books from the library. When you're planning to read for 24 hours, know that the book that looks best at the start of the day might have you snoring by Hour 20. This definitely isn't the time for Les Mis (or, in my case, any chunksters at all). Variety is great here, in form and genre. Grab some novellas, some short story collections, maybe even a graphic novel or two. I've heard the latter is great for when your eyes get tired. Also, don't be afraid to ditch your stack entirely. It happens! This is my current stack. Note the absence of my Kindle, which is currently juicing up and housing at least twenty other options. What would spending all day reading be without some delicious munchies at your fingertips? Last time, I went with homemade guacamole, Chinese take-out and some store-bought gelato. This time, I'm reprising the guac but decided to go homemade with my frozen treats. These fudge popsicles are currently firming up in the freezer and I couldn't be more excited. Don't feel like cooking yourself? The grocery store and GrubHub are your friends. Pick out your reading spot! It's going to be sunny and 60 degrees out on Readathon Day, so I know I'll be spending at least part of my time reading outside in the park near my apartment. The bed, the couch, and the comfy chair in my reading nook are also strong contenders. I might try out some reading position yoga, too. The Readathon starts in 16 hours, wherever you are in the world. I think that's what's great about readathon. It's no fail. As long as you are participating and being kind you are doing it right and winning. Love it! I hope you have a great time! I look forward to seeing your updates! I've only just started Guernsey. I had no idea it was epistolary, which is a happy surprise for the #readathon! I'm enjoying it so far.